Swarming Bees! Swarming is how honey bees reproduce at the colony level. The queen will leave the hive along with up to half of the worker bees. The swarm will cluster out in the open, often on a tree limb, while scout bees seek a suitable home. Sometimes a swarm will move on within a few hours, sometimes it may take a few days. When bees are swarming they are the least defensive and not very likely to sting. 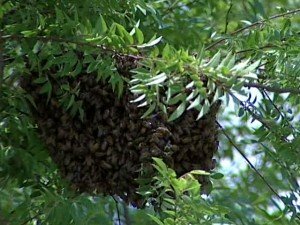 It is always a good idea to call a beekeeper if you see a hanging swarm because they are easy to catch at this point. Many times these swarms will find a hole in the side of a building and will move into an attic, eaves, or wall. Once they’ve moved in it is rather difficult to remove them. Bees in your wall? Click here. Here is a map of the Nashville area with numbers pinpointing beekeepers interested in catching swarms. Their contact information appears when you click on their pin. Many of these individuals will collect your swarm for free, some may charge a fee. Swarm catching can be challenging work and there is no guarantee of the health or quality of the bees in the swarm. If you are in another part of the state we recommend you contact your county extension agent or check the TBA’s list to see if there is a beekeeping association near you.